Why Are Display Boards Important in Schools? Display boards are a commodity item for any educational environment. Most school classrooms, halls and corridors are lined with wall mounted noticeboards, but schools can really benefit from using display boards. They are the perfect platform for showcasing everything from children’s work to visitor information and school news. Display boards are freestanding which means they can be moved easily to any location that you need to display information. They are ideal for school reception areas, opens days, parents’ evenings, art exhibitions, school events and meetings. We offer the UK’s largest range of display boards including 6,7 and 8 panel kits, modular panel and pole display boards which are available in many different sizes. We also offer table top display boards which are ideal for classroom learning and small presentations. Our pinnable display boards have the flexibility of being used with pins or Velcro to secure your notices. With each range of display boards, you have the option of choosing from aluminium or PVC frames. Jumbo display boards are available with 3 or 4 panels and are perfect for showcasing artwork and children’s work on parents’ evenings or art exhibitions. We have 13 different fabric colours to choose form giving you a wide range of variety when it comes to matching your school colours. Our display boards range features folding display boards and panel and pole display boards, each range offering different benefits for schools. Panel and pole display boards can be set up in different variations and configurations depending on the space you have available. They are perfect for creating different shapes such as zig zags and curves, or alternatively, you can place them in a straight line to showcase your information. We offer a 4, 6, 8 or 10 panel and pole display board kits. These modular display boards can be added to at any time to create a larger display. You can attach additional poles and panels depending on how big you need your display to grow. You don’t have to completely change your kit, you can simply purchase new boards and new poles which can be used alongside your existing kit. 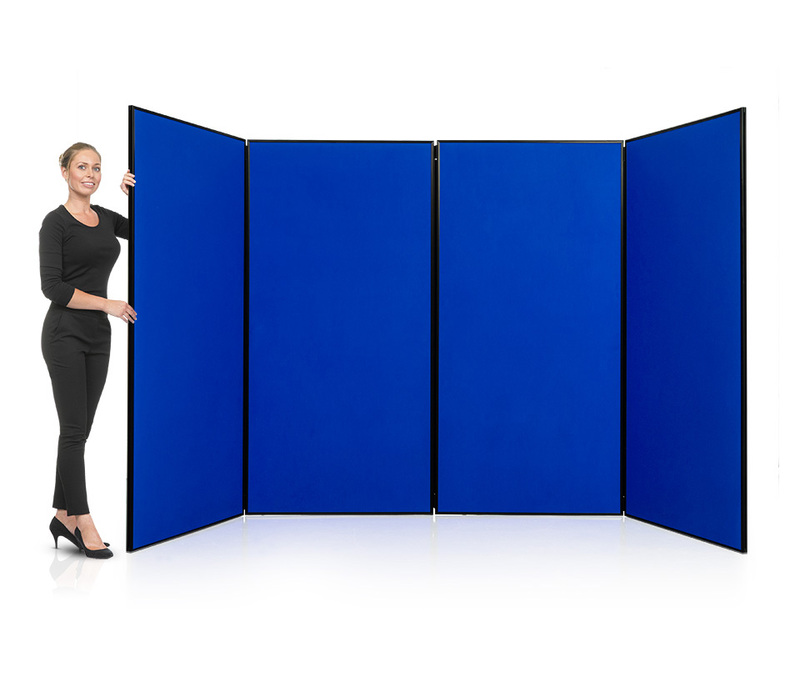 Folding display boards are lightweight and easy to assemble. The top section is made up of three panels that are hinged together and that clip on to the bottom section which is also hinged. The header panels slot on top and come with end clips which secure them in place. The folding displays boards can be used in a U-shape or zig zag configuration. The display panels feature a recess on one side of the board and a flush finish on the reverse. This is handy as it allows you to keep your posters and notices in place, even when you dismantle the display board and fold it up. It can be placed in the supplied carry bag with the posters still attached without the worry of them getting damaged. All of our display boards are double sided which allows for a much larger viewing area and is ideal if the stand is in an area that will be seen from both sides. Display boards can be used for a wide range of purposes. Not only can they be used for the most obvious reason such as displaying pupils work, but they can be used as a simple way of providing information to staff about duties and future events. The blank canvas allows you to promote any information you wish for almost any event. All of our display boards are supplied with a carry bag which holds the complete kit. The black canvas bag allows you to easily transport your panels to any destination you need to. It enables you to store the display board kit when not in use. Our best selling 6 panel PVC folding display board weighs just 6.1kg, making it light enough to take to any location in and around your school. Our school display boards take just minutes to assemble and can be built by one person. No tools are required for assembly. The folding school display boards come with hinges in two sections. The top section simply clips on to the bottom section. Our panel and pole display boards are just as easy to assemble and are supplied with everything you need in the kit. The panels feature clips which effortlessly attach the panels to the poles. You can choose to set up in a landscape or portrait orientation, depending on how you need to use them. The orientation can be changed each time you use the display board kit. We supply a wide range of display boards that are perfect for ESL or EAL teaching. Display boards are Velcro friendly, which means that you can attach various learning materials to them without damaging the product. This makes them perfect for educational games such as matching words to pictures when teaching English as a second/additional language. For more information about our display boards for schools, contact us or call a member of our sales team on 01733 511030.